Daycare Upper Darby: Is this Meltdown a Sign of Sensory Processing Disorder? Darlene’s Wee Care for Kids, in Upper Darby is a Top Rated Local® child care facility who offers services for special needs children. We can work with deaf children, as well as children with Autism or physical handicaps, who are developmentally delayed, and who have other special needs. Call us today for a tour of our facility. Every parent knows that meltdowns come with the territory. They can happen anywhere and at any time and for any reason. Maybe you were the worst parent ever and cut their sandwich just the way they usually like it, maybe you told them they can’t eat the soap. Their little bodies don’t seem to be able to contain the bewildering emotions that wash over them at any moment. As they grow older they typically grow out of meltdowns (until they are teenagers when they have new, more fun ones! ), but sometimes a meltdown is more than a just meltdown, it’s a sign of something else going on. Young children can’t express themselves accurately because they are little and just learning all the words for emotions and learning to understand their experiences. Sometimes there is a sign of sensory processing issues that might not be diagnosed until later. This week we’ll discuss what sensory processing disorder is and what it can look like at different ages. We’ll cover some coping strategies and home therapy tips in upcoming blogs. All of our senses are based on signals from the body to the brain, through the nervous system, be they smell, sight, touch, all stimulation is processed by the brain. According to the Star Institute, “Sensory Processing Disorder (SPD), exists when sensory signals are either not detected or don’t get organized into appropriate responses.” This can mean that the child either seeks out certain stimuli, avoids certain stimuli, or becomes easily overwhelmed when experiencing too much, or too little stimuli. Because this can clearly go in any direction, it can be hard to diagnose. According to Understood, an infant with SPD might not like to be held tightly, may be overly fussy, or may need to be constantly held. A toddler doesn’t like certain fabrics or shoes, or tags, for example, has more meltdowns than an average toddler. One remarkable sign in toddler and preschoolers is that they are easily overwhelmed in groups. This is relative and dependant on an individual child. 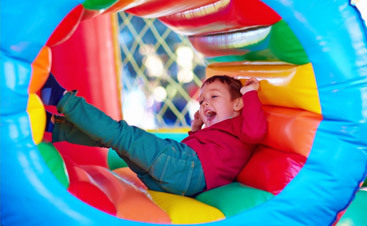 Some children may find three children too many if it’s in an already stimulating context such as a ball pit/ They may react by melting down or acting inappropriately. A grade-schooler may have trouble making friends because they are awkward, they play roughly. They may have fine motor skills that, for example, makes penmanship difficult. Check back for future blogs for more information on this topic. When you are looking for a daycare that is sensitive to your child’s needs, be they diagnosed or not, turn to Darlene’s Wee Care for Kids. We have staff that knows ASL and that have experience working with children who face challenges of all types. Call us today to schedule a tour of our facility.